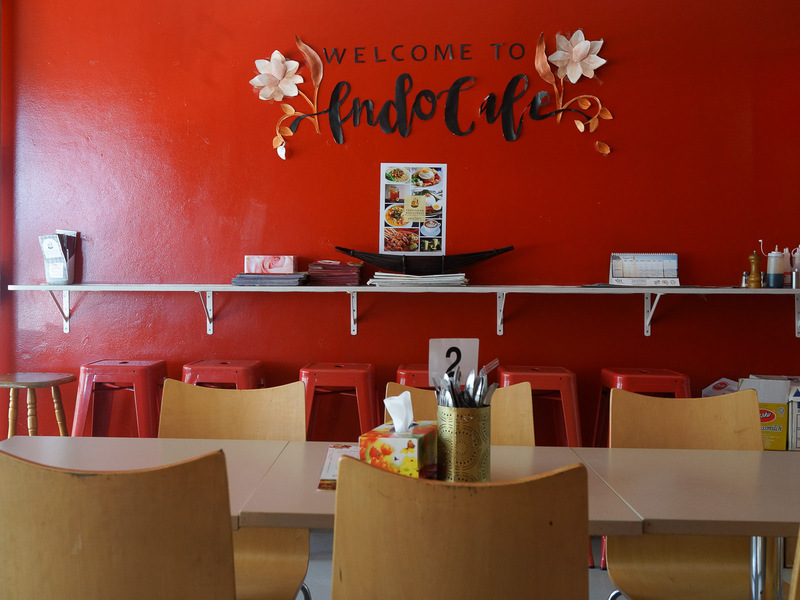 Indo Cafe is tucked away in Belmore North, a fine homestyle Indonesian joint in a small local spot. Sydney has had a string of 30 plus degree days and the hot weather really got us craving some Indonesian food. We got wind of Indo Cafe from social media, photos of the catering hooked us instantly (thanks @scoffandquaff!) So off to Belmore we trot. The walk up from Belmore Station had our eyes wide with potential delights, there's a sizeable number of Korean restos, Greek cafes and butchers and a fresh tofu shop all to be explored. We'll be back. 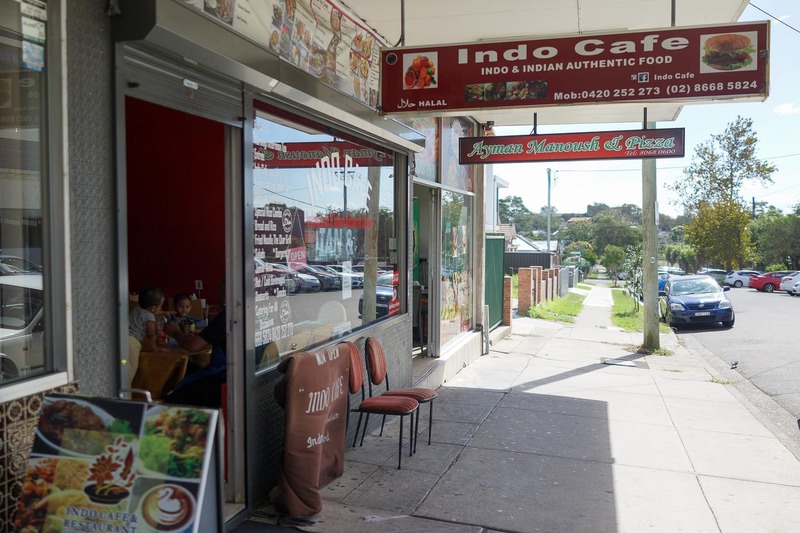 Indo Cafe serves Indonesian and Indian food, a mix of the backgrounds of the owners. We really love a place where you get to enjoy one person's cooking style and the influence of their own tastes. The boss lady's style is from Surabaya, though she cooks dishes from all over Indonesia, and has a crack at India too. We are keen to give her butter chicken a whirl. We find out her secret too - she prefers a belachan (shrimp paste) sauce to chilli on her chicken, and we are trying that out as soon as we can. The pick of the menu, bebek komplit or fried duck with tempeh and tofu, is sold out after a massive catering order wiped out all her duck stock the day before. That's enough incentive to get us back soon, along with the promise that it's served Surabayan style with boss lady's favourite belachan sauce. 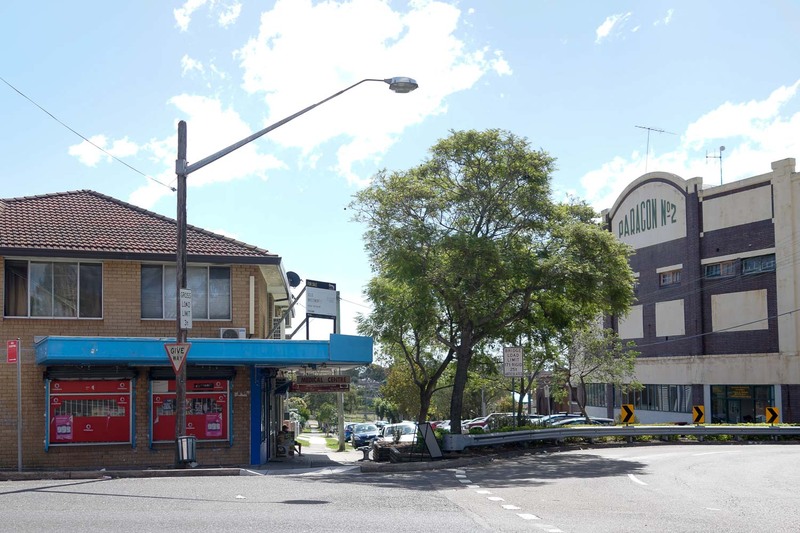 The shop is tucked up near Belmore Boys High and opposite the massive old Paragon No 2 theatre (now used for gymnastics training, see this excellent page on it's history and the nearby closed down Corner Grill.) 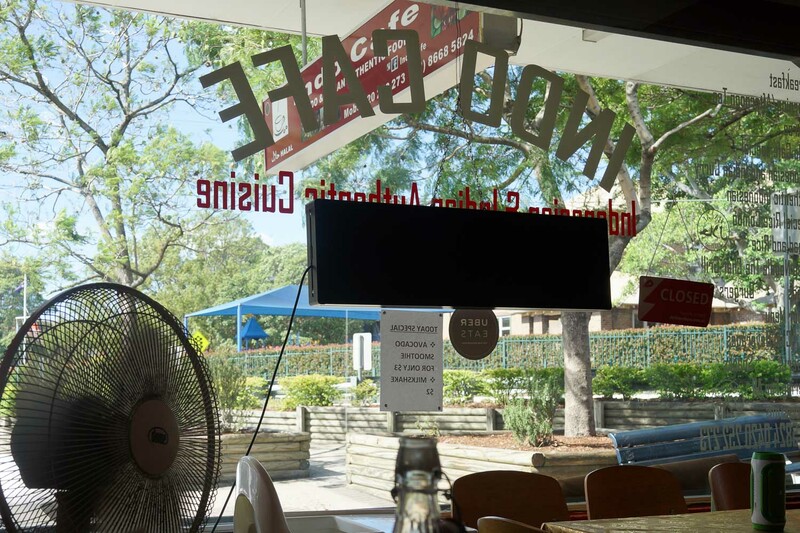 This is a locals area, a community of small stores where locals drop in and the shop neighbours hang out, chat or just razz up the owners' cute kids. Welcome to the Indo Cafe, and indeed we do feel that. Rissoles - $2 each. Lovely crumbed, fried chicken and veggie dumplings. 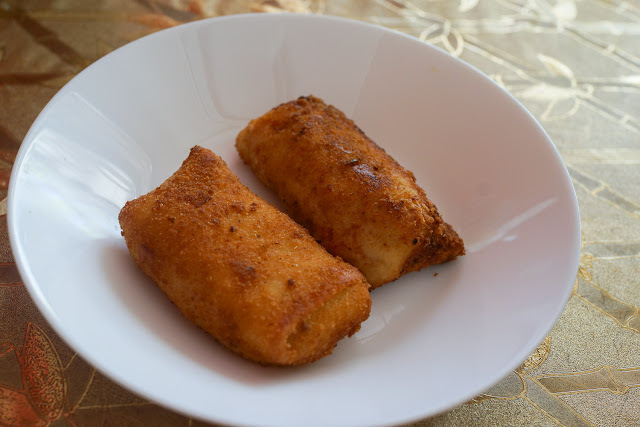 We love a rissole in any language, and these ones don't disappoint. The filling isn't too creamy, just the right mix and a super crunched up breadcrumb coating. Bakso polos - $12. The first sip of this soup gives up a lovely clear, clean broth, sensational on a hot day. It doesn't have that out-of-a-packet stock powder flavour that you sometimes get with a bakso. There's a mix of thick yellow and thin white noodles and lovely chumpy dense bakso (beef meatballs). Best bakso we've had since we were in Sumatra over the Xmas break. Ayam bakar sereh - $7. BBQ chicken topped with lemongrass and chili sambal. It's a pretty fiery chili so the boss lady gives you the option of having it on the side. We took half of this home and it was just as good if not better served cool. The chicken was dense and not dry, the skin richly flavoured and fried crisp. Nasi Komplit IndoCafe - $15. Rice with some fried chicken (same great chicken, without the chilli), salted fish (deep fried dried fish, it's like fishy chips!) on top of some sambal to dunk it in, an amazingly good'n'nutty tasting piece of fried tempeh, and the tamarind powered sweet+sour veggie soup sayur asem. 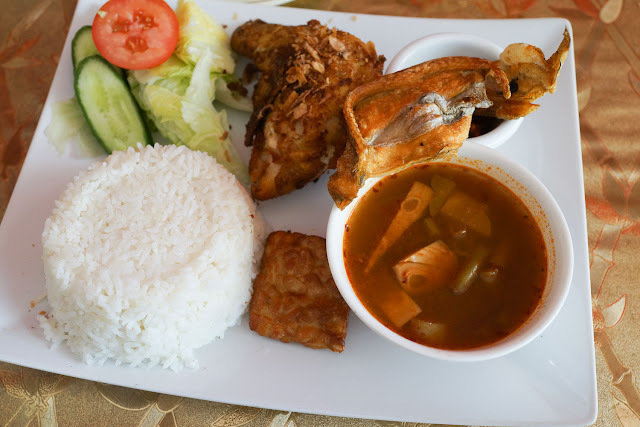 Just about everything we love about Indonesian food on one plate. The boss lady gives us a sample of her cassava leaves in coconut. 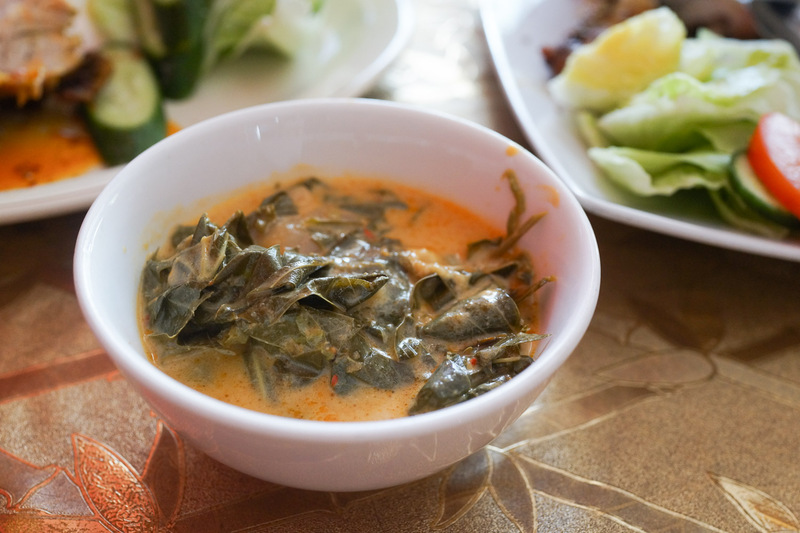 We're in luck, today the leaves are fresh from her garden, which she says makes the dish so very different from her usual frozen leaves from Indonesia. There's hidden nuggets of beef tendon in the sauce, a flavour the chef herself doesn't like but keeps in for the flavour and texture. We applaud her sacrifice! 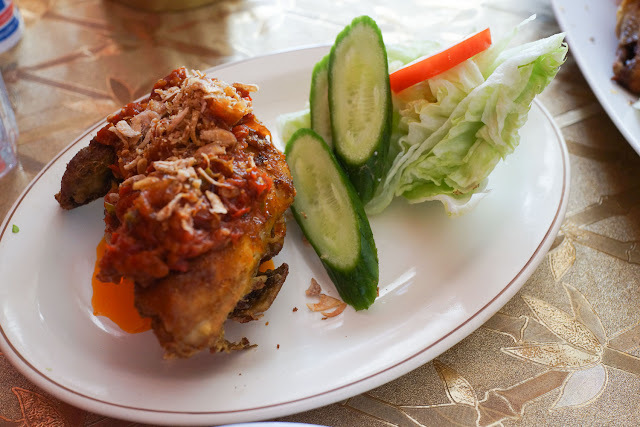 This is one of our favourite Indo dishes, we expected to find this everywhere on our last Indonesia trip but there was none to be found, so we were extra happy to try it back in Sydney. Indo Cafe is at 11/2-8 Knox St Belmore. Ph 8668 5824. It's about a 10 minute walk up and down a couple of hills from Belmore Station. Had it not been a freaky 30+ degree day (in mid-April!) we would have walked down to the Cook's River and followed it back to our pinko inner westie bubble. It's just off the corner of a busy road but the outlook is green and calming. 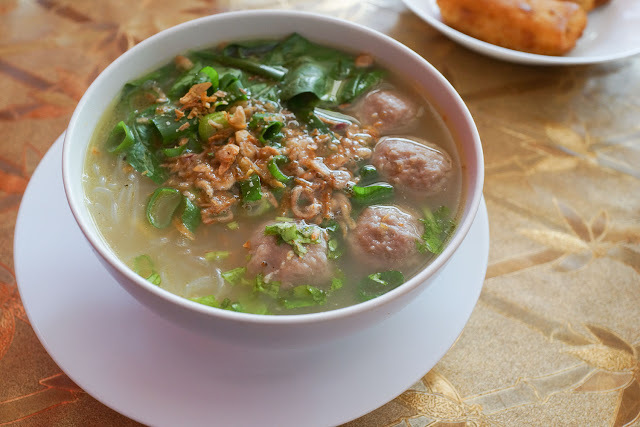 That bakso sounds great, we've been trying to get out to Maroubra for a while. Last few times we've misjudged opening times.